I pinned your visual triangle post last night and I’m still stumped on this in my house! I’m not so hot at this! I recently moved into this apartment and struggling with these build ins. Here is where I am so far and I don’t think it works. The stuff on the floor isn’t part of the dilemma. Although trying to figure out how to add it in. They are deep and wide as you can see. What do you suggest?!?? Help!! The wall color is grey. The rest of the space is browns black burlap white silver/mercury. I appreciate ANY help!!!!!!! I am desperate to figure this thing out!!!!! I’m clueless really. Thank you so much for your help! I used some visual triangles and kept the color scheme simple in silver, cream, and black for a cohesive look. Many of the accessories could be found in a thrift store and with a little silver-spray-paint action could be transformed. I hope this gets your creative juices flowing Emily! Okay, and now let’s see what creative juices have been flowing around the blogosphere this week! If you’d like to link up, please be sure to read the rules before linking. Great job on your suggestions for those shelves, Beth! I’m sure Emily was grateful for your help. I’m a little late for your party, but I’m linking up a super-simple cleaning tip–incredibly simple, really, but I thought it was worthy of sharing. 🙂 Thanks so much for hosting! amazing inspiration pic, beth! ohmyword – great visual!!! Thanks girl and thanks for linking up! I love what you did with her space, Beth! It looks GREAT! I linked up my painted vanity. I LOVE your vanity Traci! Nicely done girl. That is so neat, I love how you put it together! Thanks for hosting week after week, I’m glad to be here. Happy Tuesday! Great design ideas! I would have a hard time with built in spaces like that too! Thanks for hosting, Beth! Hope you have a great week! Hi Beth: I enjoyed your tips for Emily’s bookcase–very nice! I do appreciate you hosting the party tonight–thank you! Thank you so much and thanks for linking up! Thanks for hosting. Love what you did with her space. Great solution. Thanks for the party, Beth. I love your shelf decor ideas. Dang girl you are the styling guru. i just need to put all my crap in one pile and let you do your thing on my vignettes. I’m always here to bounce ideas off of love! Thanks so much for hosting – hope you have a wonderful week! I can not thank you enough. You did a beautiful job and have saved me some serious heartache at our house. And my husband since I redid them 10x last night til 2am and hated it all. Yay! I’m glad you liked it Emily :). You’ll have to show me your shelves when you’re finished. (And again, just some inspiration to springboard from.) I’m excited to see what you come up with. Love the design Beth! Thanks so much for hosting! I think I saw one of those globes at Target, as well as the pitchers (they have white ones in a few different sizes). Also, you could put fresh flowers in them depending on what’s available through the seasons. Beth is absolutely right about the spray paint- it has saved my decorating dilemmas SO many times. 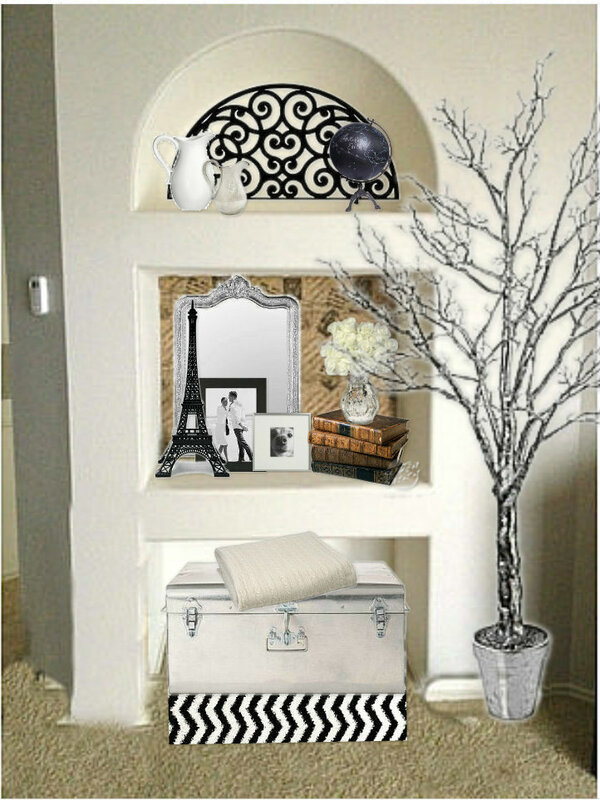 Best of luck at beautifying those built ins! Will be visiting target this week! I did see the flowers over the weekend. Thanks for hosting Beth! Have a great week! Thanks so much for hosting! I like what you did with styling the shelves. It looks great! Have a great week. That is so great- a new set of eyes can be so helpful. Shelves are tricky to fill. Great tips on styling shelving Beth! Your design looks beautiful! 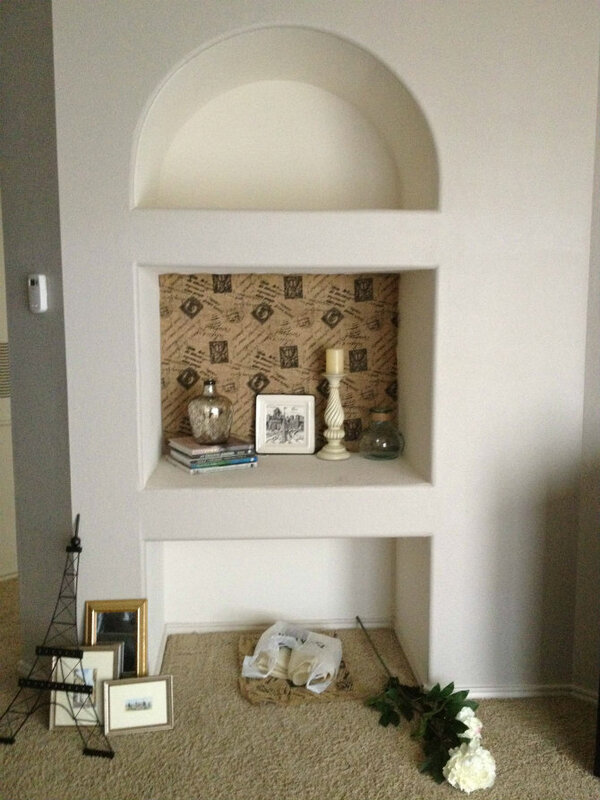 Thanks for hosting Beth and love how you styled the built ins! Great inspiration.